The Importance of RV Tire Maintenance! In parts one and two of the importance of RV tire maintenance, I discussed air pressure based on actual RV loading, regular visual inspections of your RV tires, tire pressure monitor systems, what to do with RV tires that are stored or sit static for months during full time RV living or storage, DOT codes on tires, and a discussion on when to replace RV tires. In part three of this article, I will address tire dressings, possible causes of abnormal tire wear and selecting replacement tires for your RV. There are many opinions about what to apply and what not to when it comes to tire dressings! Most people seem to like to have their RV tires shine. Sure, it looks good but most of the products people apply, including RV dealerships, only appear to attract dust and dirt. I have done lots of research on this topic! I had Michelin XRV tires on my Freightliner medium-duty truck. I checked with Michelin, and they sold a product that was water-based and contained no petroleum distillates or alcohol. These seem to be the big offending ingredients in tire dressing products! The product Michelin used to put their name on was 3-in-1 Tire Shine. I bought a few bottles, and it did a good job of keeping the tires black, but not shiny! It was a water-based UV protector. For some reason, they stopped making it. When I needed more of that product and found out that Michelin no longer sold it, I did get a tire dealer to tell me that 303 Aerospace protectant was a close formulation to the Tire Shine. I am a believer of applying something to tires to aid in the UV protection. I used the Michelin Tire Shine and then the 303 Protectant on my Michelin XRV tires for six years. Those tires had no sidewall checking and looked as good as the day I bought them when I traded the truck. They could probably have been used for a few more years according to the Michelin tire specialists. When my current Michelin and Chinese trailer tires start to get that brownish color to them, I apply the 303 Protectant, and it brings back the black color to the sidewalls. They do not have a shiny finish to them, just a deep black color! And, it does last for a while. I usually clean and apply this product to my tires once a month. We do move our RV frequently, so that helps out as well. 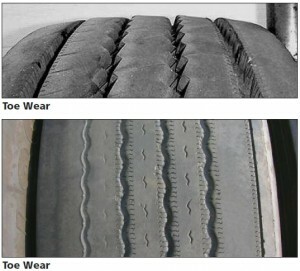 RV tires, if maintained with the correct tire pressure for the measured load, should normally wear with even tread wear. 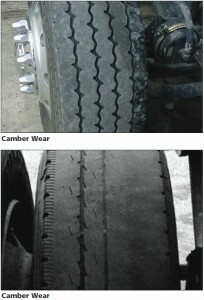 Of course, tire rotation, if recommended by the RV manufacturer can also help to assure even wear. If abnormalities start to show up in your RV tires wear pattern it might be necessary to check with the motorhome chassis manufacturer for alignment specs that could assist a certified tire dealership in correcting possible issues. According to Michelin, a feathered wear pattern on the front tires typical indicates misalignment (toe-in or toe-out) Sometimes a radial tire will not have this wear pattern unless the toe condition is severe. Instead of the feathered edge wear, the tire will be worn on the inside or outside shoulder, which could be confused with camber wear. 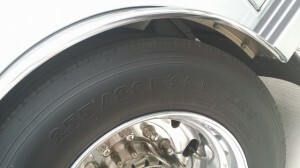 On a three-axle RV, a skewed rear axle and tag could cause feathered edge wear on one shoulder of one front tire and feathered edge on the opposite shoulder of the other front tire. To correctly diagnose a tire wear condition, the motorhome should have the alignment checked on all wheel positions. Michelin also refers to camber wear, also known as edge wear, which wear shows up on the inside or outside shoulders of the tread. Wear on the inside edge of both tires may be due to negative camber or toe-out, a misalignment. If only one tire shows edge wear, check for worn kingpin bushings, bent or worn steering components, or excessive positive camber. For solid beam axles, excessive camber can result from axle overload. Michelin publishes that if correct pressure and proper alignment are both continually maintained, tire rotation may never be needed. However, in other cases, tire rotation may be needed to help even out wear patterns caused by alignment, underinflation, or free-rolling wear problems. The most important decision an RV owner can make is the replacement of its tires when they are beyond their useful life. The replacement tire decision can be because of the tires age or that the tread is worn off. Remember that I stated earlier that the National Transportation and Safety Board recently stated that tires that are six years old should be replaced. Of course, it is best to consult a certified tire specialist when it comes to RV tires! The best way to replace RV tires is to match them with what the RV came with. 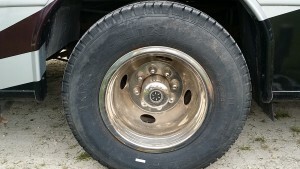 The original tires were matched with the RV for load rating, tire diameter, speed rating and the width of the tire. A major consideration for dual axles is the tire width. If an incorrect tire is chosen, the dual spacing could cause the tires to kiss during travel. This can weaken the tire sidewall over time. Also, choosing a tire with a higher load rating and increased tire pressure might sound like a good idea! But, is the rim the tire will be mounted on able to handle the increased pressure? It is best to consult a professional when making changes to the original tires that the RV was designed to be driven with. In conclusion, please don’t neglect your RV’s tires! A little regular maintenance and checking of tire pressure before travel can assure that you will not be delayed reaching your destination due to tire a related issue! Here’s wishing you trouble-free RV travels now that you are armed with some tire safety knowledge!